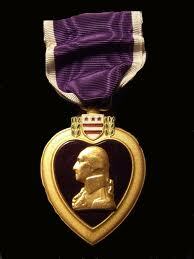 On this day in 1782 General George Washington, the commander in chief of the Continental Army, created the “Badge for Military Merit,” a decoration consisting of a purple, heart-shaped piece of silk, edged with a narrow binding of silver, with the word Merit stitched across the face in silver. The badge was to be presented to soldiers for meritorious action. Today the Purple Heart still means something to most Americans who cherish their freedom and honor those who protect it. Let’s complain about one foolish decision to exclude some soldiers from receiving it. According to the Washington Post today Army Maj. Nidal Malik Hasan’s trial opened, and the former Muslim military psychiatrist who admitted killing 13 at Fort Hood in 2009 as a defense of Islam will be acting as his own attorney. Officially, the government is still classifying the shooting rampage as an act of “workplace violence,” effectively shutting the doors on Purple Heart military awards. It is a travesty and our government should be ashamed of this mistaken classification that denies benefits to the living wounded and the families of those who died at the hand of this mad-man. WWGWD (what would George Washington do)? Make some noise and let your representatives know your disgust at calling terrorism “workplace violence” – it’s wrong. This entry was posted in Coach's Blog, denny meyer, life coach, Spiritual Coach - Denny Meyer, spiritual coaching and tagged denny meyer, Ft. Hood shooter, Nidal Hasan, pastor dennis meyer, purple heart, spiritual coach, spiritual coach denny meyer, spiritual coaching. Bookmark the permalink.